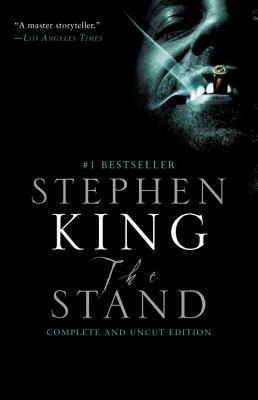 I'm not Stephen King's biggest fan, but I've always had a weakness for THE STAND. One thing I've always appreciated about Stephen King is his liberal doses of gallows humor -- and that is very much in evidence here (particularly in the early chapters as a plague is passed from one unsuspecting victim to the next). I first read THE STAND during the summer of either 1979 or 1980. I recently decided to reread it and dutifully bought the "uncut" version for my Kindle. Unfortunately King didn't just put back pages from his original manuscript, he also updated the action and references. I found this very distracting, so I immediately came to Alibris to purchase a copy of the original version of the novel... which I think is much better. i have really enjoy the book the stand I feel it is one of the b est books that he had written also I would reconned it to anyone. the book actually give more stuff than the movie. It keep you on your seat wondering what going to happen next. thanks for getting it for me kathy cox. another great book....also series on tv....will add to collection for birthday gift. This is a long and detailed tail in the King tradition. You must be a dedicated reader in order to start this one. But it's worth it. Well in my humble opinion it is the greatest piece of fiction I have read. The depth that you get to go into the lives and mins of each one of these characters is staggering. What a more over-played out theme (the struggle of good verses evil) to take onand truely do something original with. I can't say enough about the style this book was written in. The attention to detail the history of each player laid out so that the reader can form whole opinions based the merit or character flaws of every piece on the chess board. no stone left unturned so that when the books apocalyptic theme starts to develope you are actually in a position to feel like you can pass judgement on who should triumph or fal. It is often hard for me to find characters in mass market novels that really scare me, and make my skin crawl. The killer who takes on the identity of Vincent Mungo in the Shane Stevens novel "By Reason of Insanity", or the pretyy rich boy nut job in Bret Easton Elliss' "American psycho" both hit the mark. But evil pound for evil pound, the "waking dude" in "The Stand" scared the crud out of me. With an understated grace almost he draws people in to a living nightmare that surrounds him and dictates his every move and thought. And on the good side of the Rocky Mountains,lovable heroes by the truck load. a team of misfits that despite being as mixed up and challenged as the scumbags out to get them, mange to succeed in winning the readers hearts and leave them cheering. Just great entertainment for hours and hours. I've reread it 6 times since my first go around the lonely highways of Stephen Kings imagination.